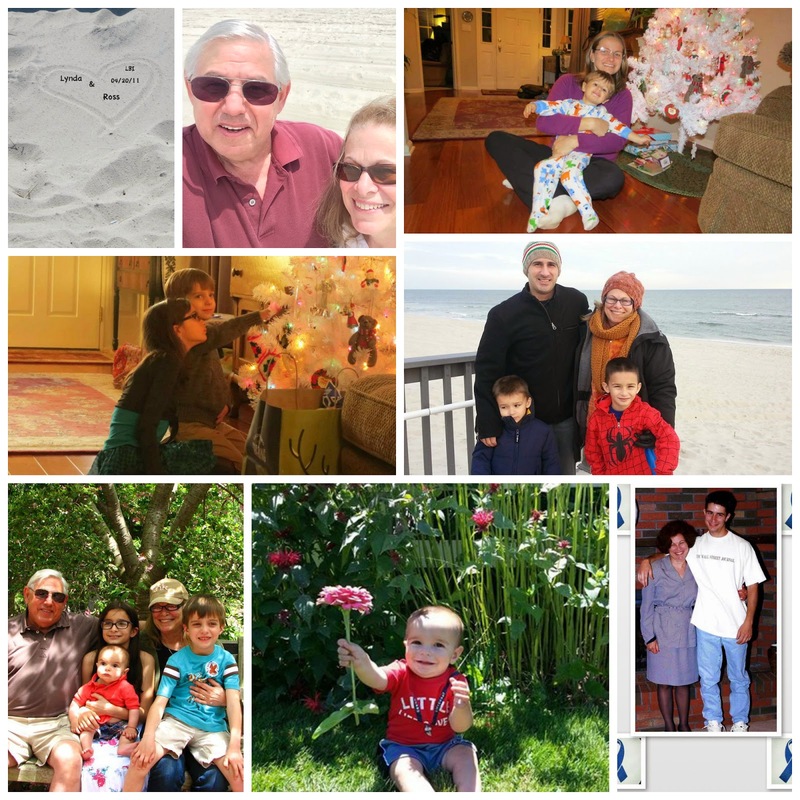 So, our grandsons’ last day with us was Thursday. It’s hard to believe that they have been gone almost a week already. The five weeks now seem to be a blur. They went by so fast. From the very beginning we quickly and naturally fell into a routine which was comfortable and accommodating for each of us. 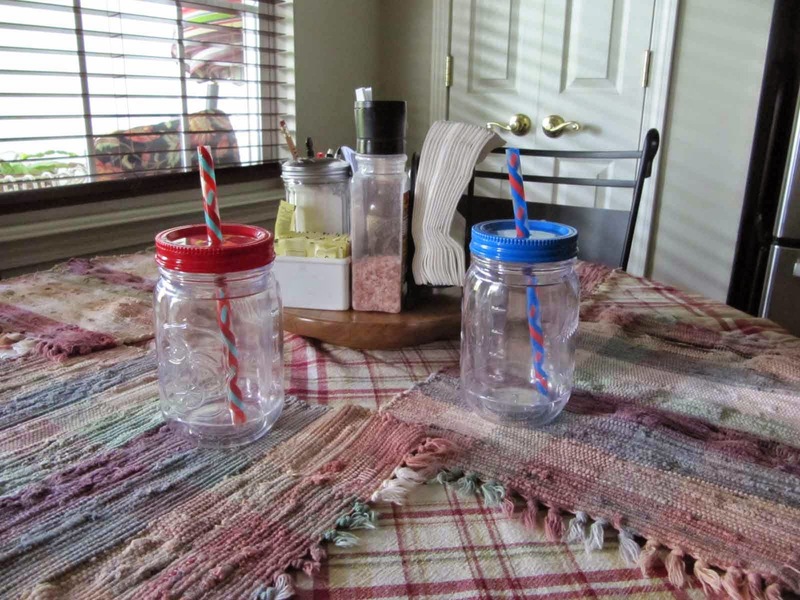 For the most part mealtimes were fairly easy. The bowls of Fruit Loops for breakfast had to contain equal amounts of cereal. It was amazing how Tyler knew if his brother had even one more Loop than he did. “Kenny has more than me,” was Ty’s standard morning observation. Lunch time was peanut butter and jelly crustless sandwiches. Grape for Kenny and strawberry for Tyler. Dinner time was whatever we decided would be on the menu, with a plate of food set aside for when Jimmy came home from work. And always, always chocolate milk to drink in their own special glasses. They had to remind me each time who got the red one and who got the blue one. Ross would take them to the pool every day. Even that became a standard routine. It would start off by me yelling “Who wants to go to the pool?” Most times the response would be a duet of “Me!” Sometimes, though, one of them would say, and mostly in a whiney voice, “Aww, I don’t want to go to the pool.” Usually, that would be Ty. But as soon as Ty saw his brother getting his bathing suit on, grabbing his towel and his guest ankle bracelet, he would immediately change his mind. By the last week, I think I had a good insight into Kenny. Everything he did revolved around how much time he could occupy until his father got home. It was an interesting observation. I understood that for Kenny, going to the pool meant using up two hours. That meant two hours closer to when his father got home. When he would ask to watch a movie or a tv show it was the same consideration for him. It was really quite touching and a little heartbreaking at the same time. Another issue for Kenny was staying close to home. I think that also had to do with making sure he was there when Jimmy got home. One of the things that we found a little challenging was finding ways to motivate the boys to leave, as they referred to it, “the neighborhood”. 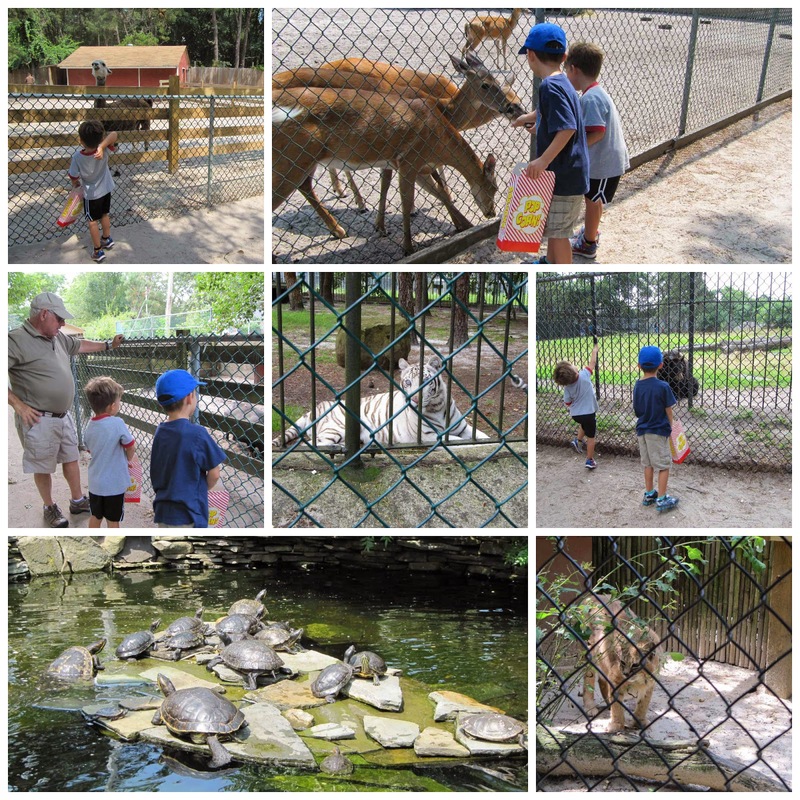 One day last week we wanted to take them to the little zoo here in our area. It’s really a rescue sanctuary for in crisis animals. It’s called Popcorn Park Zoo. We had been mentioning this to the kids since they first got here. Neither one of them said they were interested. So we I had to use a little trickery. The day we picked to go, I told the boys that we were having workman come to the house and that we had to leave for a few hours. They both started to run around and get dressed. We were out the door within 10 minutes. I told them that it was Pop-pop’s and my turn to work at the zoo. We had to feed the animals. So, even though they had to leave “the neighborhood” they had a great time. By the middle of that final week, although he didn’t express it verbally, it was obvious by the increased number of times Tyler would FaceTime with his Georgia family that he was missing home. The last day, on Thursday, Jimmy brought his boat down. He, Ross and Kenny went for a cruise around the bay. Ty and I agreed that dry land was more our preference. Back home, after the boat ride, there was a flurry of activity, packing the boys and Jimmy up. They made sure that the presents that they picked out for their Mom and sisters went into the side pocket of the backpack. 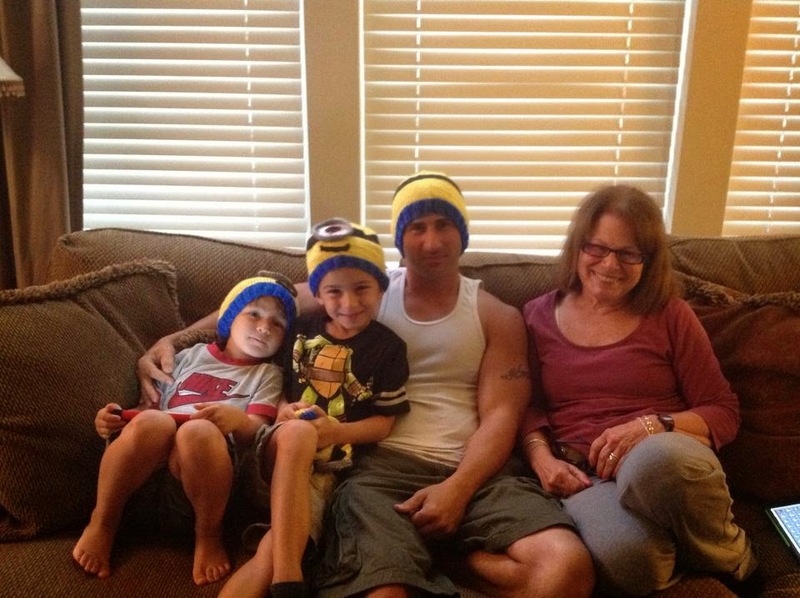 The Minion hats I made went into the suitcase. I checked under the beds, dresser drawers and the bathroom to make sure they didn’t leave anything behind. But of course they did. They left behind so many precious memories. I vaguely, but barely, remember the details of those days. 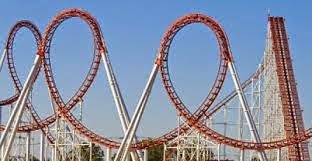 But, I vividly remember feeling that my life was like a series of amusement park rides. 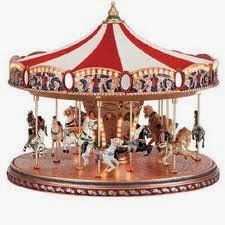 The ups and downs of a roller coaster, the round and round we go, but getting nowhere, of a carousel. I was always dragging and tired to the bone. There was never enough time. I thought about those times the other day after I left my doctor’s office. I like my doctor. She’s young, probably in her late 40’s. She’s married with two small children. She’s pretty with blond hair and caring blue eyes. At my appointments, she never seems in a rush. She will sit down, eye level with me and intently listen. I’ve had doctors who come buzzing in the room, fire questions at me and don’t even look up when I answer. They say, “okay” and mutter “uh huh”. And after the allotted time granted to me, usually a mere 4-5 minutes, it’s “Take two of these and see the front desk for your next appointment,” as they rush out the door. But not my doctor, she’s definitely not like that. At that last appointment, though, when she came into the exam room, she didn’t greet me with her usual smile and the “I’m so glad to see you” look. It was obvious to me that she was exhausted. She told me that she hadn’t had time that day to get outside for that breath of fresh air that always perks her up and gets her ready for her afternoon appointments. Apparently, she had had a bad morning. I thought to myself, this woman needs a vacation, a good and long vacation. A few days later, when I went to my hair dresser, I thought again about those past times when I felt as though I needed a good and long vacation. I like my hairdresser. She is the owner of a busy salon. She’s about my age and is a natural born schmoozer. Even though I am not a regular client, I see her about three times a year for a hair cut, she remembers who I am. I can tell that by the questions she asks me. She always spends a lot of time on my hair. But this day, there was quite a definite audible sigh at the end of her question, “So what are we doing with you hair today, Lyn?” Oh, she tried her best to muster up some enthusiasm, but it just wasn’t working. I thought to myself, this woman needs to close up shop. I am constantly amazed by the grueling schedule that my daughter, her husband and their three small children have to adhere to. It leaves them with very little free time. I don’t know where my daughter-in-law summons up the energy she needs to dedicate herself to a demanding full time job, keep up, as a single mom, with an energetic 3-1/2 year old and among other things, train for a marathon. I am impressed by the way my son fits in time to be with his boys as he works an unforgiving 11:30 - 8:00 shift. When I take a look at all of these situations, I am reminded of the time of my amusement park life. I have to wonder if it was worth it. Oh, sure, that is the way of this life. We certainly have to earn our living. When I reflect back, though, I can’t help but ask myself if there could have been some other way. I clearly remember the exact moment that I decided that I had had enough. It was Thanksgiving Day, 2001. Just a few short months after September 11, 2001. I was hosting dinner for my family. The table was set. The turkey was brown and juicy. The last of the fixin’s were ready to be served. Everyone was seated. Just as I sat down, my work beeper went off. I was on call. I spent the next four hours on my computer trouble shooting a problem. Was it a life or death issue? Not even close. One of the executives was not receiving his e-mail. I retired in July of 2002 at age 55. There are times, I admit, when I think I may have retired too soon. 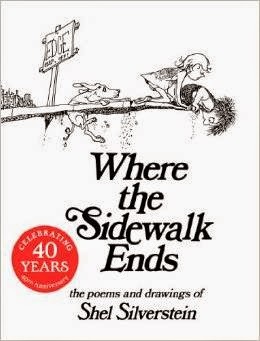 I remember something my father always used to say…”Where are you going?” I realized on that Thanksgiving day of 2001 just what he meant by that. So no, I have not one regret of my decision to retire from life’s loop-de-loop. What about you? Where are you going? Writing this on Friday, July 11. It’s the end of week three of Kenny and Tyler’s visit here. This morning Jimmy will take them back to his house. On Monday, we picked the boys up from my daughter’s and brought them back to our house for the week. My sister Johanna was up visiting from Virginia. We took the boys to the beach in the afternoon. I’ll tell you, and I’ve probably said this before, it is a chore to get two kids and two old people ready to go to the beach. The old people I’m referring to is me and Ross not you Johanna. Anyway, we had to take two cars which were loaded up with all of the beach paraphernalia. The traffic was horrible on the island. There were sirens, ambulances, and firetrucks flying down the boulevard. Okay, so we get to our favorite beach, and the parking lot was pretty empty. My first thought was that we were so lucky to have our pick of spots. It took us at least 5 minutes to unload the cars and then load us up with all of the stuff. As we were walking up the ramp to the beach, we passed a woman who was coming off the beach. She told us to forget the umbrella because we would not be able to set it up. “It’s too windy,” she said. She was right. The wind was the kind that whips the sand up in the air shooting pellets of stinging granules into your face, arms and legs. The boys had already started to run down to the water. I had to call to them to turn around and we trudged back up with all of our stuff and re-loaded the cars, which were now the only two cars in the parking lot. The boys were disappointed, but we took them to the pool when we got home and they were happy about that. Tuesday was Tyler’s fifth birthday. We had a few little things for him to open when he woke up. There will be a party for him on Saturday. My son-in-law came down with Bella and Ryan. Ross met them at the beach with Tyler and Kenny. (I had a doctor’s appointment.) This day there was no wind but the ocean was too icy cold for them to spend much time in the water. So they had fun in the sand instead. Later that evening, Tyler was excited for his father to come home with his birthday present. So excited that he, with a lot of encouragement from his brother, was able to keep those little eyes from closing until Jimmy got here. 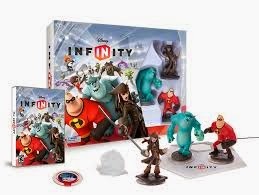 The birthday present was a Disney interactive video game called “Infinity”. Apparently, there are different play sets which you purchase separately. Ty wanted the characters which are based on the Toy Story movie. It was a good gift, especially since it has multiplayer capabilities. That means he and his brother can play nicely together and there are no arguments. NOT! I try not to get involved and somehow they manage to work it out between themselves. Wednesday, the weather was unpredictable. I took the boys to the pool and as soon as they got into the water, it started to rain. Fortunately, our community has an indoor pool. With the help of their private swim coach, Pop-pop, the boys continue to make progress with their swimming. Thursday was another cloudy day. So, it was the indoor pool again. Later in the afternoon we took the boys to the local amusement park on the island. However, we got there an hour before the rides opened. But, there is an indoor arcade. I have to say, arcades just aren’t what they used to be when my kids were young. Now, they are like mini Casinos. Bright flashing neon lights which attract the kids to games they are too young to understand. They even have “slot” machines. 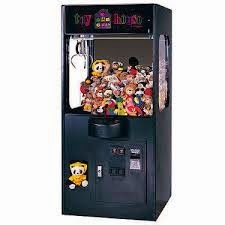 There are hardly any more games of skill, like the old pin ball machines. Instead the walls are lined with those crane games. to pick up a stuffed toy. The boys get so frustrated each time the toy drops before it gets to the shute. 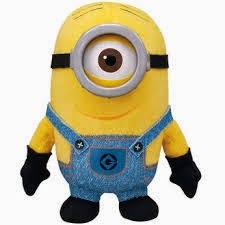 After putting in $10.00 worth of quarters, Kenny finally managed to “win” a stuffed toy Minion, which I am sure was worth no more than twenty-five cents. As we went back out into the park, just in time for the rides to open, it started to rain. So no rides this day. On the way home there was a lot of commotion in the back seat. Tyler was still upset about not “ winning” a toy. Apparently, there were complicated negotiations going on about sharing the Minion. I’m not sure what the outcome was. Like I said, I try to stay out of it and let them work it out themselves. One of the things that Kenny and I share is a love of the TV show “Big Brother.” I think it’s remarkable that he knows the names of all of the houseguests and that he has his favorites. As we were watching the live show last night, he was on the edge of his seat, hoping that his “guy” Zach, would not get voted off. He was cheering when the other houseguest Paola was sent home instead. He told me that he wants to go on Big Brother. Now, the boys are packed up and it’s time once again for hugs and good-byes, and waves out the car window until next week. 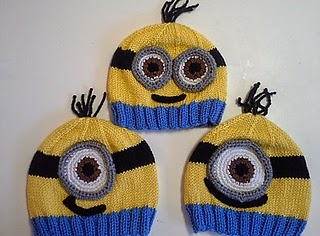 PS: I found a pattern on Ravelry for Minion hats. The boys were thrilled when I told them I would knit one for each of them. Kenny and Ty spent time with their cousins over last weekend. Friday night they were with Domani at their grandfather’s house. 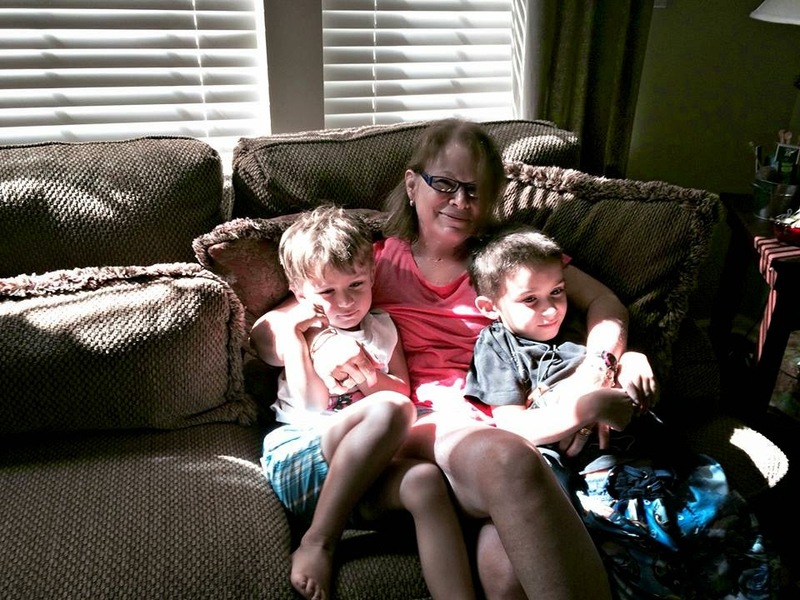 It was Christmas in June for the boys with Aunt Anne. 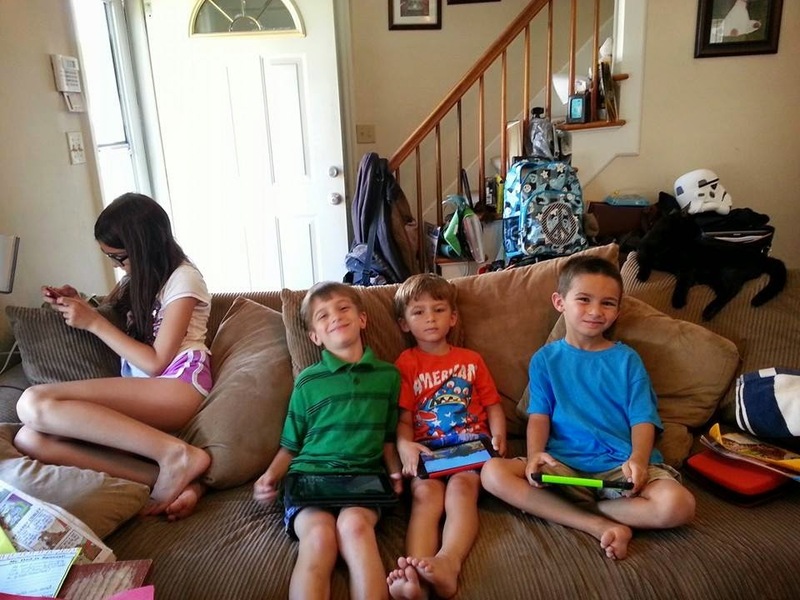 They spent Sunday night with Bella, Ryan and Jackson at Aunt Jen’s and Uncle Derek’s. While they were with Bella and Ryan they learned that they can interact with each other playing the computer game called Minecraft on their iPads. When they got to our house on Monday, they were no longer able to “connect” with each other. Now, for a person of my generation I consider myself to be a little more computer savvy than some of my peers. When I looked at this game, I was totally baffled by it. All I can say is HUH? 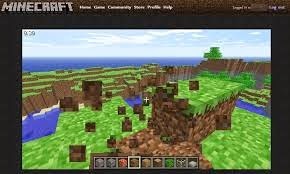 But, I was able to figure out how to configure the network settings on their iPads to allow them to enter each other’s Minecraft world’s. I told them that I was going to learn how to play so that they would be able to enter Grandma’s world. Now they keep asking when they can go to Grandma’s world. On Tuesday, for a change of pace, we took the boys to the bay beach. Although it was stinking hot that day, there was a breeze by the water. We told the kids that they could bring their super duper water guns with them. Ross and I never go to the bay beach. We prefer ocean side. 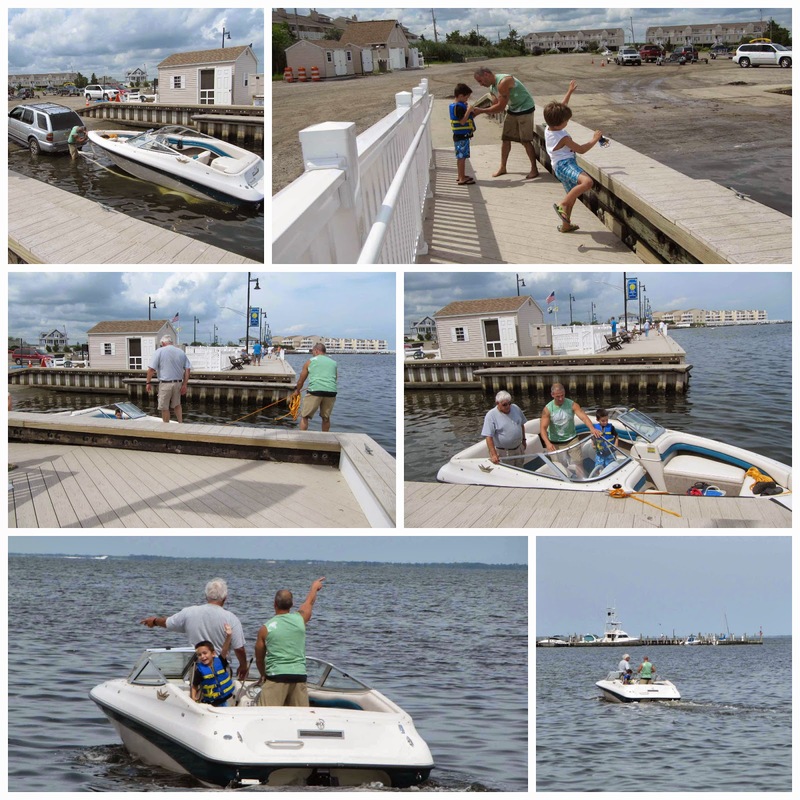 We got to the bay around noon time and it was jammed packed with little kids and their parents. We quickly understood why the bay beach is popular with this crowd. There is a fairly large fenced off area where the water is very shallow and the beach is guarded. The first thing we found out was that squirt guns were not allowed. 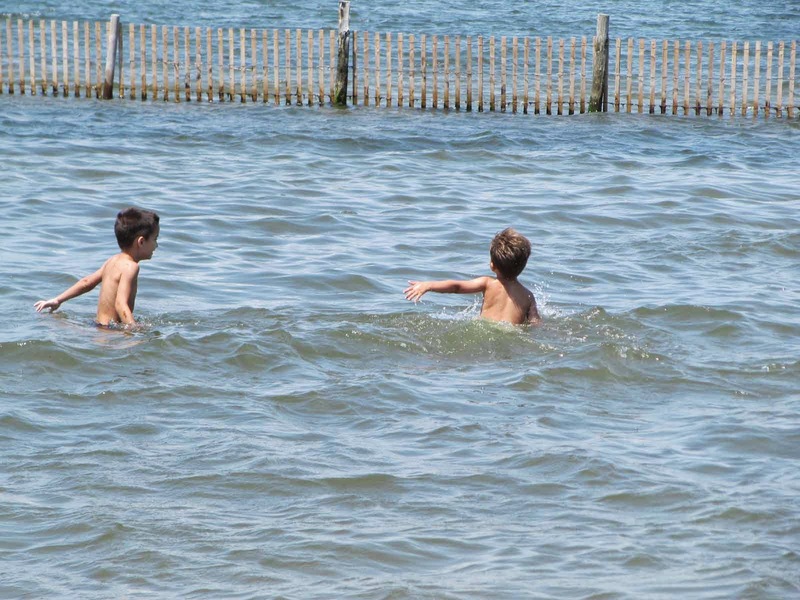 But, the boys headed right into the water. They played for a short while but were not able to “swim” like they do in the pool. They quickly got bored. We left there, went back home and they went in the pool for a short while. In the afternoon on Wednesday the boys wanted to watch a movie. They were arguing over which one to watch. Kenny wanted to watch Harry Potter. Tyler didn’t. I asked them if they had ever seen ET. They hadn’t. I tried to convince them that it was the best movie ever! I assured them that they would love it. I told them that I had taken their father to see it when he was a little kid. I asked them to try a preview and just watch it for a little while. I told them if they didn’t like it, they could watch something else. I learned a little something about Kenny that day. He can be quite stubborn. Tyler was agreeable to it. Kenny refused. He kept putting a pillow over his eyes so that he wouldn’t be able to see the TV. What I found interesting was that even though he put the pillow down as soon as the movie started and it was obvious that he was being pulled into it, he refused to admit that he was enjoying it. Since Kenny has been up late, waiting for his father to get home, he has been falling asleep in the afternoon and naps for about an hour or so. And, he fell asleep in the middle of the movie. Tyler, though, stayed awake through the whole thing. 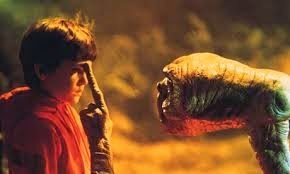 I keep asking Kenny if he wants to watch the rest of ET. Stubbornly, he says no. Because of the holiday, Jimmy has a nice long three day weekend. 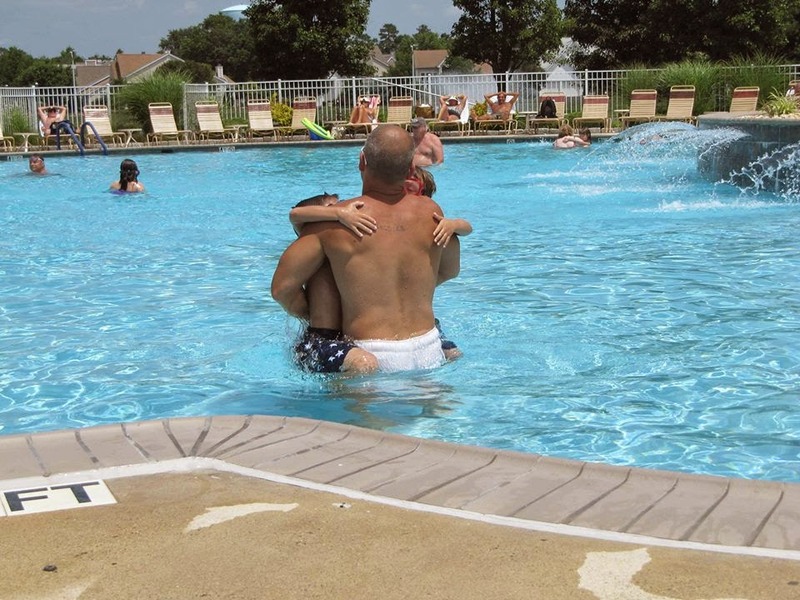 Yesterday, before he and the boys left to go back to Jimmy’s house, we took the kids to the pool. Those boys just cannot get enough of their father. The week flew by. 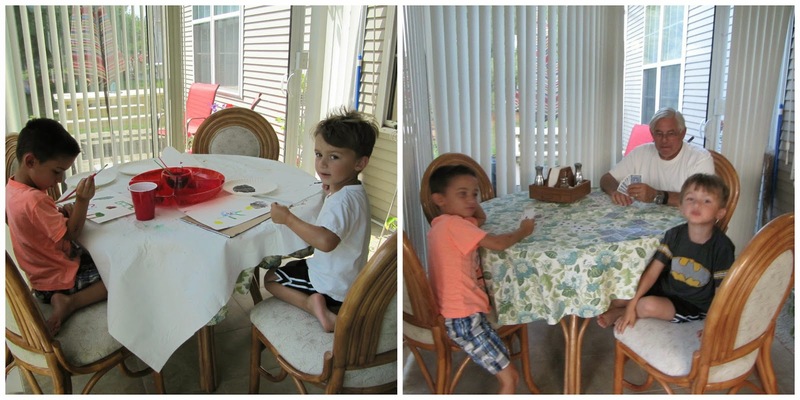 There were arts and crafts and “Go Fish” card games with Pop-Pop. So far the weather has been perfect every day for time at the pool. Ross has been slowly and patiently teaching the boys how to float on their backs, do the dead man’s float, and blow bubbles. Tyler is a little more persistent than Kenny. But they both try hard. He thinks that by the end of their visit they will each know how to swim. Today, it’s raining here as a result from the backlash of Hurricane Arthur. We have no plans. Maybe I’ll watch ET again. That movie still makes me feel all mushy. Kenny, I hope you will finish watching it someday. I have been discovered…again. I have been enjoying my apparent anonymity for probably over a year now. It’s been working out quite nicely. I have been able to coast along, unnoticed. I thought I had figured out how to avoid and dodge them and keep them at bay. But, for the past three days, I have been harassed, harangued, used and abused. That 301 number? That is the number of spam comments I received on my last post. They all came in today and they are all from the same “person". I had my comment option set to allow all comments, even anonymous, but to moderate comments after my post was 2 days old. That method worked because usually the spammers would pick older posts. Now, because of this one spammer, I have had to change the comment option to moderate all comments. This means that my mailbox is being blasted. I wish Blogger would have an option to “Not Allow” comments from “Anonymous”. Any advice would be greatly appreciated. From anyone but you, Spammer BOT! BTW, Today is my birthday. Yay!